Ram Trucks returns as “Official Automotive Sponsor” of Texas Parks and Wildlife Outdoor Annual Hunting and Fishing Regulations guide with a series of ads whose images are intended to be reminiscent of nostalgic national park posters created in the 1930s and '40s to stir the public's imagination for travel and adventure. There are four ads in the guide that, per Ram, will be distributed to more than three million Texas outdoorsmen beginning now. The two full-page and two two-page spread ads are by Anderson Design Group of Nashville, Tenn. The graphics firm was tapped for the job by Ram Truck AOR, Dallas-based The Richards Group. The ads are similar in color, theme and illustration style to the Art Deco Works Projects Administration National Park Poster series created after the Great Depression to promote the natural beauty of America's parks. "This was the perfect opportunity to take a different creative approach," said Olivier Francois, chief marketing officer, Chrysler Group LLC. 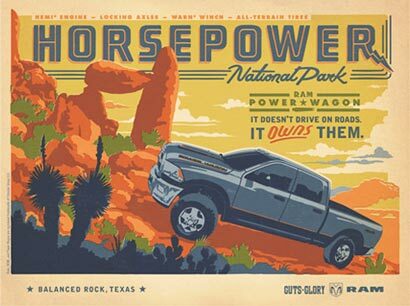 "The use of vintage type-styles, hand-rendered illustrations and muted color palettes creates a nostalgic approach to advertising art that we hope will resonate with consumers just as the original posters helped romanticize each national park destination." The ads feature renderings of the Rio Grande Valley, Balanced Rock, Enchanted Rock and Lighthouse Rock, using them as settings for the Ram 1500 Mossy Oak Edition Outdoorsman, Ram 2500 Power Wagon, Ram 1500 Lone Star and Ram 1500 Laramie Longhorn. The ads tout the HEMI(r) V-8 engine, towing capacity, all-terrain tires, versatility, and interior styling. The prints and postcard sets from the ads are for sale at www.ramtrucks.com/outfitter and also at www.AndersonDesignGroup.com/HorsepowerNationalPark. Texas is the biggest truck market in the U.S. by a country mile, and, in fact, the largest single pickup truck market in the world.